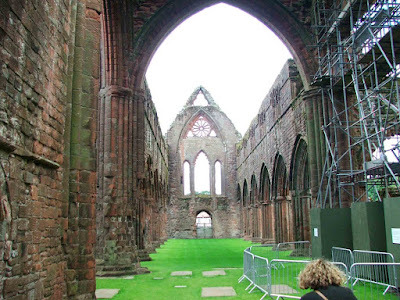 The beautiful red stone remains of Sweetheart Abbey lay in the village of New Abbey, about six miles South of Dumfries. The abbey was first established by Lady Devorgilla, wife of John de Balliol, on the 10th of April, 1273. It was her wish to have this Cistercian abbey dedicated as a memorial to her husband, who died in October of 1268. Lady Devorgilla had her husband's heart removed, embalmed and encased in a silver and ivory box. Upon her orders, it was then buried with her beneath the high altar of the abbey in 1290. In her honour, the abbey was re-named as Sweethheart abbey, a name that it has retained to this day. Sweetheart was a daughter abbey to nearby Dundrennan abbey. The remains of the abbey are many and varied, offering a good few hours of investigation. The abbey covers a huge area, consisting of 30 acres of walled precinct, surrounded by a high wall built of granite blocks that would originally have been around 4 metres high. The blocks were removed from the site when the monks were clearing the way for the building to begin. The wall was only built on three sides of the precinct with a water filled ditch being created on the fourth. The wall still survives to its full height in most places. There are what appear to be small openings in the wall where it survives to full height. These openings, only large enough to put a hand through, could well have been some form of defence...gun loops for example. They are definitely deliberate holes, as they have small lintels over their tops. 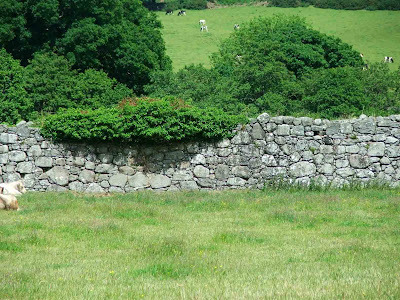 Elsewhere, the wall is missing its top foot or two, and as there is a distinct lack of any rubble at these parts of the wall, one can only assume that these missing stones have been incorporated into local buildings. It is thought that the tower at Sweetheart was possibly built with defence in mind. 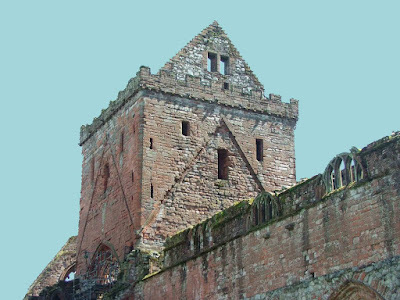 The top of the tower still retains its crenellations, and it would have been secured with heavy doors, narrow corridors and draw bars. 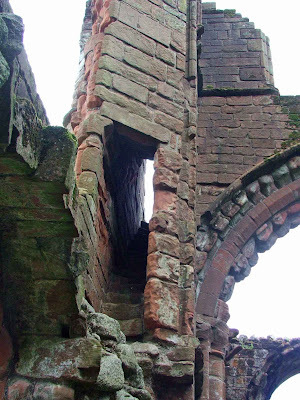 The upper portions of the tower were only accessible via narrow mural passageways built within the substantial walls (as shown below) and these passageways in turn, were only accessible via a spiral staircase built into the north west side of the main abbey building. The main entrances into the church were all endowed with draw-bar slots, indicating that it was possible to secure the abbey and prevent entry. Whilst not exactly a fortress, the abbey was certainly capable of being locked down tight enough to prevent un-authorised entry. The west gate to the abbey would have had a huge wooden door, secured also, with draw-bars. This entry-way would most likely have been the main way in and out of the abbey, and as such was well protected against minor attacks. Likewise, the gateway to the Cloisters would also have had a wooden door secured with draw-bars. 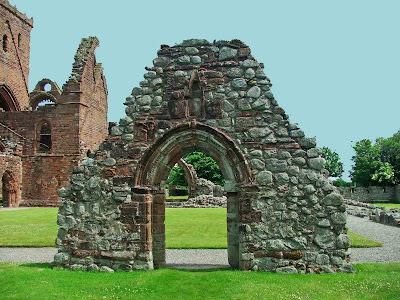 Sweetheart was the last monastery of any significant size to be established in Scotland, and was severely damaged in the war with England in the later stages of the 13th century. Indeed, documentation tells us that nearly £5000 of damaged was done by the English army and its Welsh mercenaries when they were sent North by Edward I to strip King John of his throne. The abbey was rebuilt by Douglas, Lord of Galloway (the Grim Douglas) when the abbey came under his patronage in the 14th century. It was probably about this time that the abbey began to flourish, earning most of its fortune from sheep farming (much like Shap abbey south of the border in Cumbria) In the 16th century, Sweetheart gained another rich patron, Lord Maxwell. Following the Reformation of 1560, Maxwell was ordered to destroy the buildings at Sweetheart, but he refused to do so. The last abbot, Gilbert Broun continued to resist the destruction of the abbey, but was eventually forced into exile around 1587. He attempted to continue the long tradition of the abbey by returning twice, but each time was arrested, spending time imprisoned at Blackness castle and eventually exiled to France where he died in 1612, a broken man. The abbey fell into disrepair, with the local population regarding the fallen masonry as an easy source of building materials. As long ago as 1779, some locals decided that enough materials had been removed from the now ruined abbey, and set up a group to help protect what was left. In 1928, the ruins were passed into the care of the government, securing its long term survival. About half a mile to the East of the abbey, the remains of a fortified tower can be found, Abbot's Tower, a fortified residence, possibly once belonging to Gilbert Broun. 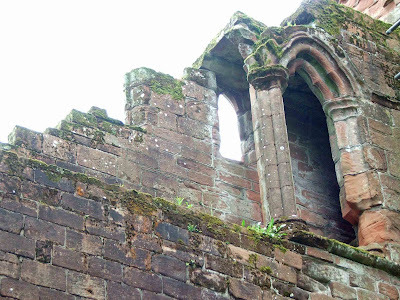 I recently stumbled across Sweatheart Abbey and Dundrennan Abbey on a day out from Whitehaven. All I can say is the scenary in southwest Scotland is on a par with the Lake District. From Southerness I could see a large area of the Cumbrian Coast which fulfilled a curiosity I had as a small child growing up in Lowca near Whitehaven to wonder what it would be like to bee on the other side of the sea. All I can say is "magnificant"
Gorgeous. Reminds me of Tinturn Abby in Wales.